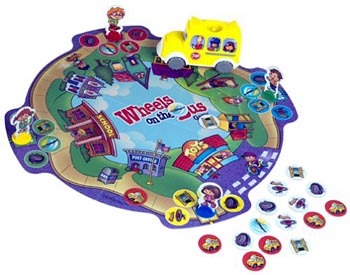 Wheels on the Bus Board Game by Hasbro. The Wheels on the Bus Game will probably drive adults 'round and 'round the bend, with its all-talking, all-singing action, powered by three AA batteries (not included). But designed for 3- to 6-year-olds, this combination of memory game, play-acting, and sing-along fits nicely into Milton Bradley's My First Games portfolio. Players take turns rolling the musical yellow bus to their space on the board. Pressing the hood tells them which of the four tokens (door, wiper, horn, or wheel) to locate by turning over any two of the 20 face- down tokens. Make a match, and keep the token; collect all four, and it's an express ride to the winner's circle.